Last month we integrated the hand to the shoulder using some of the principles from Body-Mind Centering (BMC). Today, we will explore the relationship of the hand to the ribs. This comes from the BMC developmental work. In utero, an infants’ hands are curled up into little fists, usually with the thumb inside. The hand begins to uncoil from the pinky toward the thumb in the process of learning how to push down with the hands to lift the head. Review the baby sphinx study in the post on the abdominals. When the baby is resting belly down, his little fists are usually under his chest with the pinky side down. The baby begins to push through the outside of the pinky and ulna as he begins to separate himself from the earth. Over time the pinky finger comes out and the dorsal surface presses down. As it does, the first two ribs begin to lift away from the floor. As each finger opens and roots down, another two or three ribs are able to leave the floor. Working in this way, find the following connections: ribs 1-2 to the pinky finger, ribs 3-4 to the ring finger, ribs 5-6 to the middle finger, ribs 7-9 to the pointer finger, and ribs 10-12 to the thumb. Continue to explore these connections in other poses. Another great study that I first learned in dance, I believe from the Bartenieff fundamentals, is telescoping arms. Rest on your right side with your head on a blanket, right arm straight out from the shoulder, and legs bent. Stack your left hand over your right hand. Find a gentle rocking rhythm, spiraling the spine from the tail and rotating gently through the ribs. Each of the following instructions can be repeated several times allowing for a gradual progression. Let the top hand slide past the bottom hand and then to the wrist. Slide the top hand to the bottom elbow and then back out beyond the fingers. Continue to the bottom shoulder and back out beyond the fingers. Let the hand come to the heart (or mouth) and then back out beyond the fingers. Slide to the top shoulder and back out passed the fingers. Then let the top arm brush along the bottom arm, across the chest and suspend like pulling back an arrow. Then rewind, sliding back out and passed the bottom fingers. Finally, let the top arm sweep open all the way to rest in a twist. Take a couple of breaths. Then curl the fingers in, slide across the chest and back to resting, hand on top of hand. Now reach the fingers passed the bottom hand and begin to arc the arm up toward the sky, opening like a book into a twist. Curl the finger in. Slide the hand across the chest, the bottom arm and passed the fingers. Repeat several times. Then reverse, sliding the hand across the bottom arm, across the chest and open into a twist. Coordinate the initiation of the tail and the fingers together to reach back up toward the sky, closing the arms like a book, and stacking the hands. Repeat several times. This study is a continuation of telescoping arms. Rest the arm overhead alongside of your ear. Keeping the arm close to your head, begin your rocking motion. Initiate the movement from the tail and let it spiral toward your head. Notice the rolling through the ribcage. After a few, let the arm separate from the head a bit. As you rock forward, let the arm fall forward. As you come to center, let it suspend or reach slightly through center. As you rock back, let the arm fall backwards. Let it be lazy at first – close to the body. After a few of these, let the range of the arm get a little bigger. 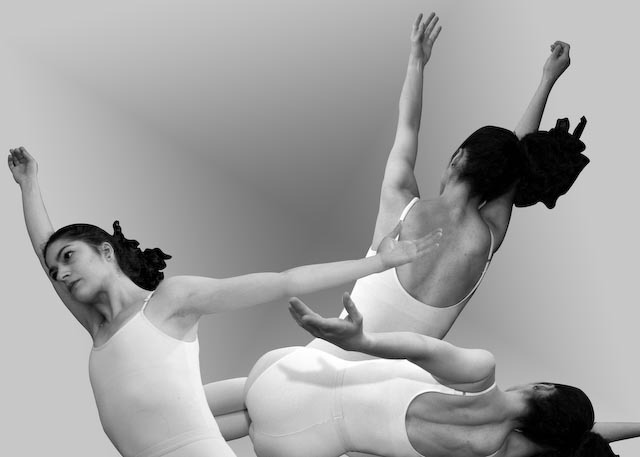 Find a natural rhythm of suspending in space and falling into gravity – little overcurves. Eventually begin to add a stronger reach as you circumscribe arcs overhead, letting the top arm sweep passed the bottom arm, arc overhead and then open into a twist. Rewind. Coordinate the reach of the fingers with the initiation of the tail. After a few repetitions, let the arm circle all the way around, on the floor if you can, brushing lightly over the hip and belly. Make sure to incorporate the spiraling through the ribcage. And explore the perfect balance between a relaxed lazy arm and that little bit of effort that extends the reach through space. When you are ready, reverse your direction for a few rounds. And then rest, letting your body absorb before switching sides.